Woke up at 7 this morning so we could go down to Laurel County Chiropractic and see Dr. Anthony DeCarlo. I am so happy I did! He was so wonderful, he did x-rays on my back, and I found out that I have a little bit of Scoliosis and that's why my back has been bothering me for soooo long. I have always tried to work out to make my back strong, and could never figure out why it just always hurt. He taught me some good stretching and pointed out facts that made so much sense; things I already knew, just put them in a new perspective. Hopefully my body will start to feel better. I spent much of day cleaning out my cart and getting rid of stuff I don't need. 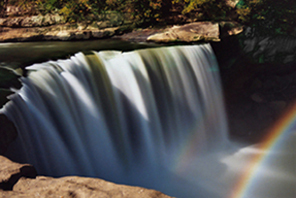 In the afternoon, Darryl took me out to Cumberland falls, which is the only waterfall in the northern hemisphere that creates a moonbow <---(Click! Not my picture, but this is what long exposure of Cumberland falls at a full moon could look like) during full moons. Beautiful place, set in the Daniel Boone National Forest. Cloudy and drizzling a little, but we had the place almost to ourselves. After that we stopped at the post office so I could ship home some stuff. Page, his daughter, and her friend and I went out to dinner at Apple Bees and then went back home and stayed up chatting for awhile, and nearly burnt the house down when Page was trying to make cookies, and didn't know there was a box of pizza in he oven from lunch... haha, nothing happened, but there was a bit of commotion for a minute. Great off day, just enough relaxation time, and got to see some of natures beauty. Thank Darryl and family!